Boston Celtics swingman Evan Turner, center, is presented with a replica of his college jersey by Ohio State University president Dr. Michael Drake, left, and athletic director Gene Smith Tuesday night. Celtics swingman Evan Turner had an outstanding college career at Ohio State. In 2010, he was named the Naismith College Player of the Year and also won the John Wooden Award. He was also selected as the National Player of the Year by Fox, Associated Press, and Sporting News. Turner averaged 20.4 points and 9.2 rebounds per game. After leading the Buckeyes to the Big Ten tournament championship, Turner and Ohio State finished up the season with a trip to the Sweet 16 and a 29-8 record. 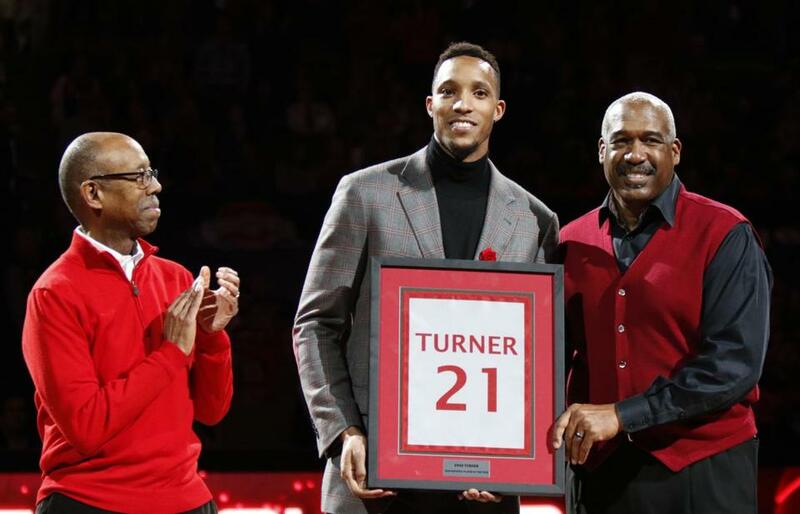 With the NBA on its All-Star break, Ohio State honored Turner Tuesday night by retiring his jersey, No. 21. Turner returned to Columbus, where he was joined by Celtics teammate Jared Sullinger. During Turner’s tenure, Sullinger was one of the top high school recruits at the time and lived in Columbus. Turner spent quite a bit of time with the Sullinger family during his days at OSU. Celtics president Danny Ainge was also in attendance for the ceremony. “I am so blessed to have my jersey retired at @OhioStAthletics. This would not be possible without my teammates and coaches,” Turner wrote on Twitter. Turner is just the fifth Ohio State men’s basketball player to have his number retired, including former Celtic John Havlicek. The ceremony came at halftime of Ohio State’s game with Michigan. The Buckeyes went on to defeat the Wolverines, 76-66. Turner was selected No. 2 overall by the Philadelphia 76ers in the 2010 NBA Draft. He signed with the Celtics as a free agent in 2014. He played in all 82 games last season, with 55 starts. He averaged 9.5 points, 5.5 assists and 5.1 rebounds. Turner is having another solid season with the Celtics this year, with averages of 9.9 points, 4.4 assists and 4.7 rebounds.